Simulating Success helps NICUs to implement simulation-based neonatal resuscitation training programs at their hospitals with the goal of improving resuscitation team performance during preterm and term deliveries. 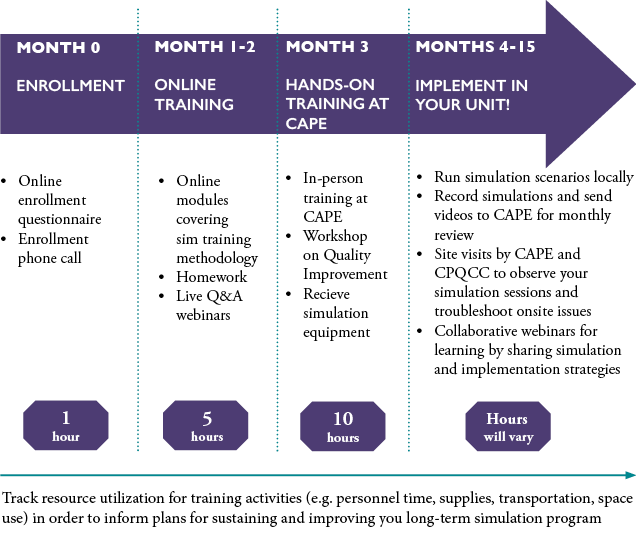 Simulating Success is being offered in partnership with the Center for Advanced Pediatric & Perinatal Education (CAPE) at Stanford University, an internationally recognized leader in obstetric and neonatal simulation-based training. Simulation-based learning has been shown to improve the safety, efficiency and effectiveness of neonatal resuscitation. Safe, effective, and efficient team performance during a resuscitation can help prevent neonatal mortality and serious morbidities such as bronchopulmonary dysplasia (BPD) and hypoxic-ischemic encephalopathy. BPD affects up to 35% of VLBW infants across California. Simulating Success is a 15-month project which includes three months of preparatory training followed by 12 months of implementation. Participating sites will implement the project beginning in March 2018, June 2018, September 2018, December 2018, or March 2019. Email Janine Bergin, Simulating Success Project Manager.